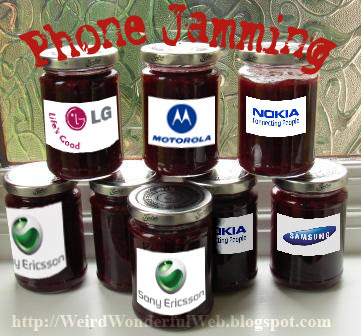 Weird Wonderful Web: Phone Jam spreads easily! Although I like the idea and may have just accidentally coined a phrase, 'phone jam' is not a slang term for leaking earwax due to too many hours on your phone. The act of 'Phone jamming' to be more precise, is something that is apparently on the increase. Did you know you can buy a device called a 'Phone Jammer', roughly the size of a cigarette packet, that at a push of a button sends out a powerful radio signal which will block/cut the signal to and from any mobile (cell) phones in a 30-foot radius? Depending on your requirements, there are varying sizes with power and price to match, ranging from $50 to thousands. The larger ones are bought by businesses like restaurants and theatres, but the popular ones are the small hand-held ones being snapped up by regular commuters whom "just can't take it no more". Hehe. But be aware, before you rush off to buy one of these, using a phone jammer is probably illegal in your country. For instance, using a phone jammer in the US is illegal and punishable by a fine of up to $11,000 (£5,500) for a first offence. Ouch! So who are the selfish ones? Is it the irritating phone user oblivious to the pissed off people around them? Or is it the Phone Jammer user, smiting the signal of the loud, obnoxious chatter while also taking down the quiet, discreet chatter with one fell swoop via the 'button of power'? "The cell phone talker thinks his rights go above that of people around him, and the jammer thinks his are the more important rights." ... "we jammin', jammin', hope ya like jammin' too". For more on the story see New York Times. To buy one of these groovy gadgets go to PhoneJammer.